Fall is one of the best seasons to visit Kyoto. And it’s coming soon. Unlike summer it is not so hot/humid, and unlike winter it is not so cold/snowy. September in Kyoto is still very hot and humid. And in the end of November it is relatively chilly. So you might be tempted to define that fall is October to the middle of November, but there are other things to consider as well. The comfortable weather is not the only reason people want to visit Kyoto during fall. The autumn leaves are also a big (possibly bigger) attraction. 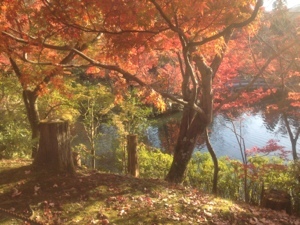 Fortunately there are plenty of places where you can enjoy viewing the autumn leaves in Kyoto. And the best time to see them is usually from the end of November to the beginning of December (but this might be different from year to year due to the weather). So if you want something other than comfortable weather as the reason to visit Kyoto, then do consider checking out the beautiful autumn leaves. For your information, the following picture is the one I took at Eikando on November 26th in 2012. For more information for planning your Kyoto trip, please consider buying the Kyoto Guidebook (ebook), which is now available on Amazon. I’ll be in Japan from the end of September to mid-October. Hopefully, I’ll get to see some signs of fall while I’m there. These pictures are really beautiful! Depending on where you will visit, I’m sure you will be able to enjoy some autumn atmosphere. And weather will be very comfortable for sightseeing and doing activities:) Have a nice trip! Thank you very much! I’m assuming the colder areas will hit autumn first. I am going up to Hokkaido, so maybe there?